Each person has 2 kidneys situated in the lower back. Each kidney is made up of ~ 1 million tiny filtering units called the “glomeruli”. The glomeruli filter or cleanse our blood continuously to produce urine to remove waste products, salts and excess water from our body. 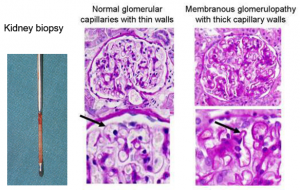 Diseases that affect the glomeruli are called glomerulopathy or glomerulonephritis. When glomeruli become damaged, protein and blood may leak into the urine resulting in proteinuria or hematuria. This may also result in body swelling, high blood pressure and even kidney failure. Membranous nephropathy is a disease that leads to changes and inflammation of the structures inside the kidney. It is caused by thickening of the glomerular basement membrane which is part of the kidney that helps filter wastes and fluids. The thickened basement membrane does not work normally, hence, leads to losing of a large amount of protein in the urine. 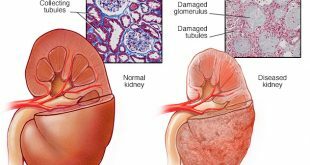 Membranous nephropathy is one type of glomerulopathy that is most commonly seen in adults over the age of 40. From the 2nd Report of the Malaysian Registry of Renal Biopsy, membranous GN accounts for 11% of all primary glomerulonephritis. The mean age at biopsy was 45.3 + 14.7, with a range between 19 and 80.8 years. Most cases of membranous nephropathy are “idiopathic” which means we do not know the cause. Drugs eg Penicillamine , Timethadione. Oedema or Nephrotic syndrome – body swelling especially around the eyes, feet and hands. This is due to the leakage of a large amount of protein in the urine. From the 2nd Report of the Malaysian Registry of Renal Biopsy, the majority (70%) of patients with membranous nephropathy presented with nephrotic syndrome. 22% presented with asymptomatic urinary abnormalities. High blood pressure was found in 21% of cases and 37% presented with impaired kidney function (eGFR< 60mls/min). the level of kidney functions and to look for possible secondary causes. Kidney biopsy: to get a small piece of kidney tissue for examination under the microscope. Under the microscope, membranous nephropathy is characterised by subepithelial immune deposits with spikes and thickening of the basement membrane. This test is needed to confirm the diagnosis of membranous nephropathy. 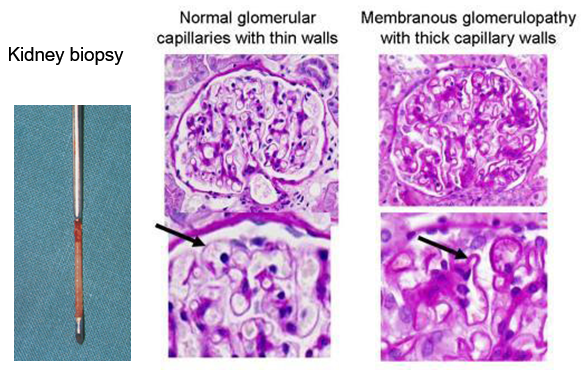 The natural history of membranous nephropathy varies greatly. For some patients (~30%), membranous nephropathy may go away on its own with time, without treatment and this is most likely in mild cases. For another 30%, it may improve slightly or remain stable over many years. In another 30% of cases, it may get worse and result in progressive loss of kidney function with time. These are the patients that need aggressive treatment to stop or slow the disease progression.